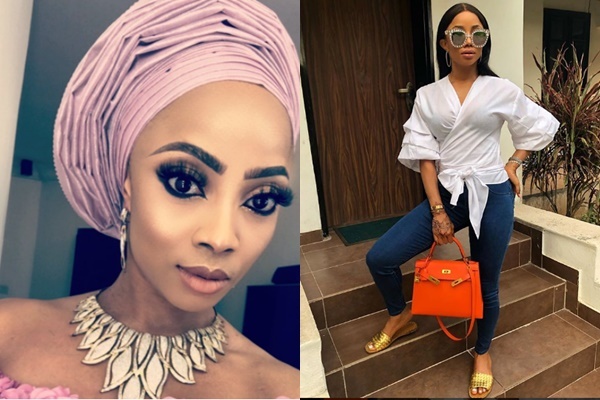 Media personality, Toke Makinwa seems to have given up on the menfolk. 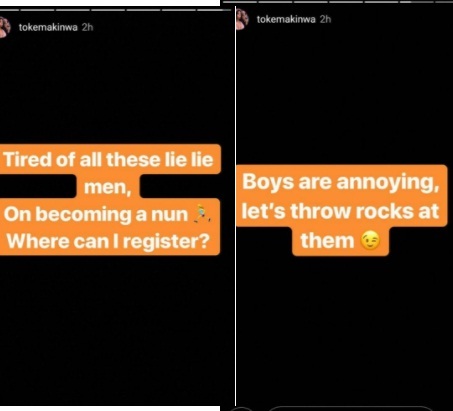 She took to her Instagram story to say that she is tired of men that lie and even asked for how she can become a nun. Earlier this month, the OAP revealed via her Instagram page that she recently had a surgery. According to her, she was urged to share the experience after she watched an inspirational video. I like to think I’m strong, I like to think my mind is positive and I’m out here focused on me, building to have a better life than I’ve had and just trying to leave this world a better place. Watching this clip broke me because this has been my state of mind this year. The devil targeted my mind. He tried to make me lose my mind!!!! Somehow strong TM started to live in a lot fear and doubt and the fear quickly turned to depression. I could sell out my bags or kill it at a stage play or smash another milestone in my career and be so happy today and wake up sad the next. The devil started planting words of uncertainty in my heart and I started to drift. I started to feel unworthy and it was a strange feeling I had a very important procedure and I didn’t tell anyone simply because a part of me wanted out from it. (Can you believe the cheek), last week I went into surgery and as the doctors did their thing, Jesus did his. He was there to lift all the unnecessary burden and give me a new heart and as I woke up I felt different. I felt chosen, I felt like I went thru a re-birth and I share this because someone out there is struggling too. We all have bad days but it’s not a bad life, we all doubt ourselves and feel uncertain but the fact that you are still breathing, there’s a second chance being given. It’s hard because we’ve become a people who shame others for opening up and who ridicule others to hide our own insecurities but I had to share this because just because you think TM is strong and untouchable which she probably is, I let the devil in without knowing it. Once you lose the battle over your mind, once you accept the negativity and let the doubt in and begin to listen to those words, you let the devil win and he will take it all. I know it’s hard, the fact that you face this challenge is tough enough but God is building you up to show you off so you too can one day say you’ve been thru the fire and you came out on the other side cos you have been chosen. It’s never easy for the selected. Your life will inspire someone to live again, take another chance, build again and stay alive. Stay winning”.